If you are looking to be a Legal Executive then you will be looking for the next step up from a legal assistant role. You will already have experience of providing administrative and general support for a law firm and providing support to lawyers. As a Legal Executive you will be qualified and have registered with the Institute of Legal Executives. In this role you will be advising clients on your specialist area such as property, family law, probate etc. If you have found a role in which you want to apply for, please see the below example covering letter that you can use as a guide. 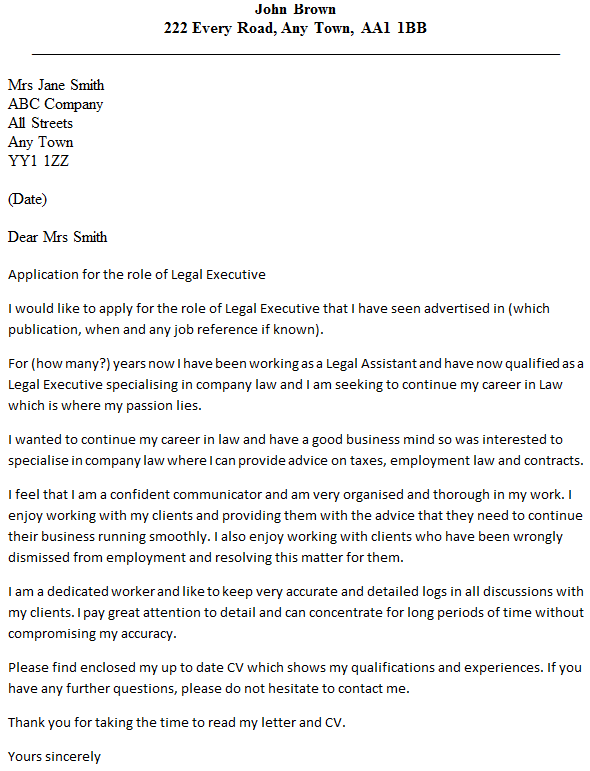 I would like to apply for the role of Legal Executive that I have seen advertised in (which publication, when and any job reference if known). For (how many?) years now I have been working as a Legal Assistant and have now qualified as a Legal Executive specialising in company law and I am seeking to continue my career in Law which is where my passion lies. I wanted to continue my career in law and have a good business mind so was interested to specialise in company law where I can provide advice on taxes, employment law and contracts. I feel that I am a confident communicator and am very organised and thorough in my work. I enjoy working with my clients and providing them with the advice that they need to continue their business running smoothly. I also enjoy working with clients who have been wrongly dismissed from employment and resolving this matter for them. I am a dedicated worker and like to keep very accurate and detailed logs in all discussions with my clients. I pay great attention to detail and can concentrate for long periods of time without compromising my accuracy. Please find enclosed my up to date CV which shows my qualifications and experiences. If you have any further questions, please do not hesitate to contact me.